Should I Buy Surplus Ammo? If you are in the market to stock up on bulk ammo, then consider buying surplus ammo. Surplus ammo is ammo that was purchased and not used. The military is known for selling off its unused ammo to recoup some of the expenses. They store cartridges in weather resistant metal cans, which allows the rounds to remain potent for decades if handled correctly. Since the ammo is being resold, it usually sells for less than bulk ammo although it’s worthwhile to compare prices. Is there a return policy if the ammo is not in good condition? Is the ammo suitable for your weapon? What year was the ammo originally purchased? There are some calibers that are high pressure and while they may fit into your gun they may not fire properly. Firing a cartridge with high pressure can cause misfires, damage to your weapon or utter catastrophe. For example, you should not fire 5.56mm cartridges in rifles chambered for .223 or 7.62mm NATO in a gun chambered for a .308 Winchester. Those that buy surplus ammo often comment that it fires better than commercial ammo. Foreign countries often sell off their surplus bullets and since they were most likely purchased for government use, the quality is high. A complaint is that many cartridges, especially those from foreign entities, use Berdan primer which makes them harder to reload. One thing to watch out for is ammo that is corrosive. 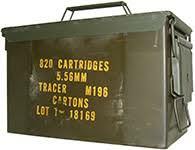 It’s common to find corrosive ammo in military surplus. Boxer-primed ammo is rarely corrosive while Berdan-primed ammo has a high chance of having corrosive properties. What is “corrosive” ammunition? A cartridge manufactured with a particular type of primer will leave a residue of salt after it has been fired. Once it has been burned, the primer will turn into potassium or sodium chloride. Sodium chloride is the same as table salt. Salt draws moisture and we all know what happens to metal when it is exposed to salt water. It rusts. It’s not a sin to shoot corrosive ammunition but to ensure that it won’t damage your gun, clean the residue out of the weapon after each use. You can use hot, soapy water to clean away the salt as long as the weapon is dried and lubricated. If you prefer, there are several good cleaning agents on the market. Modern ammunition is leaps and bounds over bullets that were manufactured 100 years ago. Gone are the toxic chemicals and poisonous ingredients. Experts say that anything manufactured in the last 50 years is fair game. In fact, it’s still being used by the U.S. military. Whatever caustic ingredients remain should burn off and not cause any issues. The biggest concern is corrosion and degraded gunpowder. When loading your weapon, inspect each bullet for signs of corrosion and discoloration as it could indicate unusable or dangerous ammo. If you want an inexpensive way to stock up on ammo, then surplus ammo is the way to go. Keep it safely stored and enjoy it for decades to come. What is a Militarized Police Force?